Gulch Radio News – The Gulch? Q – Why do you call your station the Gulch? A – The Gulch is a neighborhood in an old mining town in central Arizona. Jerome is a collection music loving characters. Sadly radio reception is poor, so GulchRadio ancestors erected a tiny radio station to supply the artisans with some tunes for the days work and the nights fun. 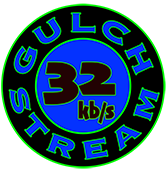 GulchRadio Streamin’ is a response to the endless whine “we can’t get you very well.” Now you can in 96 kbps quality sound, as well as 32 kbps. It’s all about the music in the Gulch. Now we are a full fledged 24/7 FM radio station covering the entire Verde Vslley, Sedona, I-17 almost all the way to Flagstaff. So, if you’re in the neighborhood set your FM dial to 100.5 and let the rockin’ begin. Q – What the hell am I gonna hear when I tune into GulchRadio? Q – How come I don’t see the song titles on my player always? A – Sometimes there are live programs on the Gulch – when we’re live, the scrolling music bar will stop on the last song played. Review our program schedule and description. Q – I love that song, what’s the name of it? A – If it’s still playing look on the “now playing bar on the “Music” page. GulchRadio streams both live shows and daily playlists. The music lists change everyday. We can usually tell you the name of songs you liked if you can tell us the approximate time the song played, you’ll have to tell us where you are because time zones around the world are different – and if you can give us some idea of the song lyric, male or female artist, that will help us find it. GulchRadio is different from many other streaming radio stations because we don’t play just a few playlists over and over. Everyday is different and the song you like might not play again for several weeks, so you’ll have to help us out finding the “one” you’re looking for. Q – Why don’t your playlists show somewhere on your website? A – We haven’t figured out how to do that yet – we’d like to, but this is an all volunteer radio station, so we have posting our lists on our “to do” lists. We are currently working on that. Q – How many songs do you have in GulchRadio’s music library. A – The Gulch has a huge music library. We have more than 18,000 titles. We regularly play around 7,000 of those titles – you won’t hear the same songs over and over on the Gulch. Q – Will you play requests? Q – How about dedications – can I dedicate a song or my request to someone? Q – I want to buy “that song” – how can I do that? A – If it is playing right now you can hit the “buy” button on the music page “now playing” bar. If not, much of our music is available at the iTunes music store. We hope to have a direct “buy” link soon. Q – I tried to listen on the internet, but I can’t make it work right – it skips and stutters? Q – When I try to tune in I get a message that says”stream can’t accept anymore connections, what’s with that? Our stream is popular. At the end of January we doubled our number of connections so you shouldn’t have difficulty tuning in and you shouldn’t get the message below anymore. Q – Sometimes when your live shows end, my connection drops or sounds too weird to listen to. Why? Q – Do I have to listen on the Streamlicensing.com page each time?. A- Nothings perfect. Every now and then some link in the process goes down. The Gulch has to pass through three different systems before it reaches you. Check back frequently, usually issues that prevent listening are resolved quickly. Check like – every minute – every second – every nano second! Don’t miss a thing. Q – When I pressed your “PLAY NOW” button, on the home page, nothing happened, I’m a little frustrated now? A – If nothing pops up” for you to use, it’s possible that your internet browser, like Internet Explorer, Firefox, Safari or Netscape have the preferences set to stop “pop ups” from working. Check the software preferences in the browser you use. I would like to known the name of a song I heard at gulch tonight. It was a male singer and there was a very remarkable percussion on it. I’m from Salvador, state of Bahia, Brazil and the percussions in this song remember too much the bands of my city. It played about between 01am and 01:30am. Today, april, 28. Day and time from Brazil. Thanks a lot, I hope You can help me. Sorry for my bad english. Hi Marecelo – The song you heard was on the show UnderCurrents and I believe it was Paul Simon “The Obvious Child” from his album Rhythm of the Saints. Thanks for listening – your English is way better than my Portuguese! your unique best makes chandler a place to chill till I make it up the hill. Hey Geneo the Doctor – thanks for the notes! Glad your keeping cool with Gulch Radio! Hi-I caught your station (100.5 FM) this weekend traveling from Flag to Phoenix and back. Heard some great Blues Friday afternoon (Oct. 14) and Oldies this afternoon (Oct. 16). Can you please tell me the name of a jazzy, be-bop saxophone instrumental I heard this afternoon? It was around 5:36pm after a Buddy Holly song and before “Swearing to God” by the Four Seasons. It was playing as a background while the DJ was going through the playlist and continued after he was done speaking. Thank you for the great traveling tunes!! Hi – Sure, it was Ace Cannon and “Tuff” – glad you enjoyed the tunes. You can listen to us on the internet, thanks for listening. This Texas boy drove to Tuzigoot yesterday and discovered one of my new favorite radio stations. Thank you! Welcome to Arizona Travis, glad you found the Gulch – you can take us back to Texas with on the internet. Thanks for writing! the Country Club to many to list, thanks Rod..
Hi Rod – glad you enjoy the station. We are a low power FM with 100 watts. Don’t be offended, but there is currently a lot of weirdness out there in the radio world concerning hacking into radio station systems and transmissions and we’d rather not discuss our technical details in a public forum. I hope you understand. Good morning Johnny and your family. Glad you enjoy our Verde Valley community and will visit us often. Thanks for turning folks onto Gulch Radio, we appreciate the support and we’re pleased that enjoy the station to the level that you tell your friends. We hope all is well in your world. Thanks very much for writing! Can I pick up a couple bumper stickers or t-shirts from The Gulch? Zach- bumper stickers? yes! – t-shirts? Nope, sorry, we can’t afford them. Another great day of music. Mayall to Young. Love them. Thanks! Love your music ! I live just south of Seattle and have been listening to you since my wife’s cousin told me about you a couple of years ago. We were traveling thru the SW in April and May and spent some time in Jerome. We walked thru most of the town (doesn’t take long !) and asked quite a few folks in the local shops where we could find Gulch Radio. No one knew ! Or at least they wouldn’t admit it – each one had a different story about Gulch Radio. Wanted to get a picture and maybe t-shirt or hat to bring back home. Best I could do was a Gulch sticker from Tom Rocks (think I have that shop name right). Where in the heck are you ??? Hi Keith – thanks for the letter. Glad you like the tunes. We are hard to find, but not on purpose. We’re on the bottom floor of a residence in the Gulch, one of Jerome’s defined neighborhoods. Jerome doesn’t use street addresses, we have them, but the Post Office doesn’t deliver, so addresses are essentially ignored. Our address is 776 Gulch Lane. Gulch Lane is not a street, it is a lane, which is a walking trail. If you visit again, send me a note to gulchradio@hotmail.com and we’ll tell you how to get here. Our antenna is easy to find – it’s at the old high school complex, about half a mile from our studios. The only swag we have is bumper stickers. We’re all volunteer, dependent on donations and at this time we can’t afford an inventory of t-shirts, hats, mugs, totes, etc. maybe later. Ran out of GulchRadio Stickers!!! Gave too many away. How do I buy about a dozen? The Gulch is a real asset to the community. I really don’t listen to over the air radio as it is so repetitious. Bought a satellite receiver years ago to get interesting music. Your little station is better than anything offered on the Sirius/XM. Just tuned into the Gulch by accident a year or two ago after we moved here in November 2015. Love it. Congrats on a job well done. PS I’d buy T-Shirts too for myself and as gifts if you had them. Hi Michael – thanks for the good words and writing. Glad you enjoy the station. Currently we don’t have t-shirts, we do have bumper stickers, send us you address in an e-mail to: gulchradiO@hotmail.com if you would like some. Hi, we are listening to you from England, we were coming to Jerome to meet our old friend, John who moved there; sadly he died about a year ago, BUT we are coming anyway. Love the music, sets the mood and we will tune to 100.5 FM as soon as our RV is close enough. Cheers – Ian and friends. Hi Ian – Yes, sadly John passed away. He was a very popular fellow in the community.John was a close neighbor. You’ll love your visit to town and you can pick up our signal from the top of Mingus Mountain above Jerome to all over the Verde Valley and Sedona. Safe travels and welcome to Jerome. I love this radio station so much! I even have it on low while I’m sleeping. I love e fact that you are not afraid to introduce new artists or play songs that never appeared on top forty lists.would love o hear some of Asia’s haunting songs.the blues you play make me so ok happy. Recently I am not able to tune in your station at 100.5 FM at night and morning on any radio. It drops off around 9 to 9:30 pm and also not available in the early morning. What has happened? Is this a temporary problem or a new permanent situation? I’m the late night driver for the Enchantment Resort employee shuttle (Midnight Sue). We love the Gulch !! For some time now I can’t Rock Out !! Do you go off the air? Hope you’re well up on the Hill. Miss You!!! holy yippeeeeeee !!!!!!!!!!!!!!!!!!!!! you are back on !!! I had given up hope..when did you get turned on again????? I have you set on my radio and on a whim i just thought I should check…and sure as shoot..there you are…can’t wait to tell everyone you are back !! Internet stream, music royalties, electricity and special programs cost money - if you'd like to lend a hand. You may click the "Donate" below to donate via PayPal..